One notable highlight of the Halloween season in Manistee is the popular Ghost Ship, otherwise known throughout the year as the S.S. City of Milwaukee, docked off Arthur Street in Manistee. The Ghost Ship is typically held on Friday and Saturday nights throughout October. Thousands visit the Ghost Ship, which has been transformed into a ghoulish and frightening haunted attraction. Navigating the steep stairways deep into the Ghost Ship is challenging enough--having people jump out of the darkness is definitely a scary and heart-stopping experience! Even if you're from out of town and taking a road trip to Manistee to enjoy the Ghost Ship, it's worth the drive! You'll find the Ghost Ship located at 99 Arthur Street--just take US-31 into town and you'll see it docked to the right on Manistee Lake, just after the bridge. The Ghost Ship is generally open from 7:30pm-10:30pm every Friday and Saturday throughout October. In 2018, the cost to enter was $10 for those 7 and up; 6 and under free. There is special pricing for groups of 15 or more. The Ghost Ship is NOT recommended for children under 7. 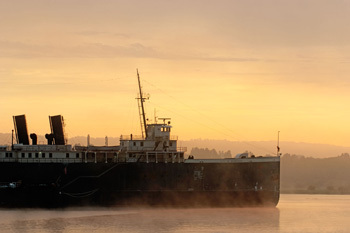 Ghouls, vampires and zombies await your arrival this October on Manistee's Ghost Ship. It's a treat you will never forget! If you wonder what happens to the S.S. City of Milwaukee when it's not being used as the Ghost Ship, read more about the happenings aboard the S.S. City of Milwaukee Ship throughout the year. Volunteers from the Century Boat Club will soon be working aboard the S.S. City of Milwaukee making necessary repairs. Restoration work includes stripping paint from the walls of the pilot house, recovering tables in the dining hall, and installing new chair rails and baseboards in the aft pilot house. Future projects will involve stripping floors, replacing floor boards and polishing the brass fixtures in the pilot house. Plans for 2015 include stripping the original wood floor and staining it.